One of the most famous Mets of all time is posed in Pirates gear here. After all, Donn spent the first decade-plus of his career in the Pittsburgh organization. My example of this card is in the EX range — no creases but some noticeable corner wear and a clean back. This is a common card from the 2nd series. The trivia question on the back asks how many times Babe Ruth hit more than 50 homers. The answer is four time (1920, 1921, 1927, 1928). Ruth hit between 40 and 50 homers seven times. 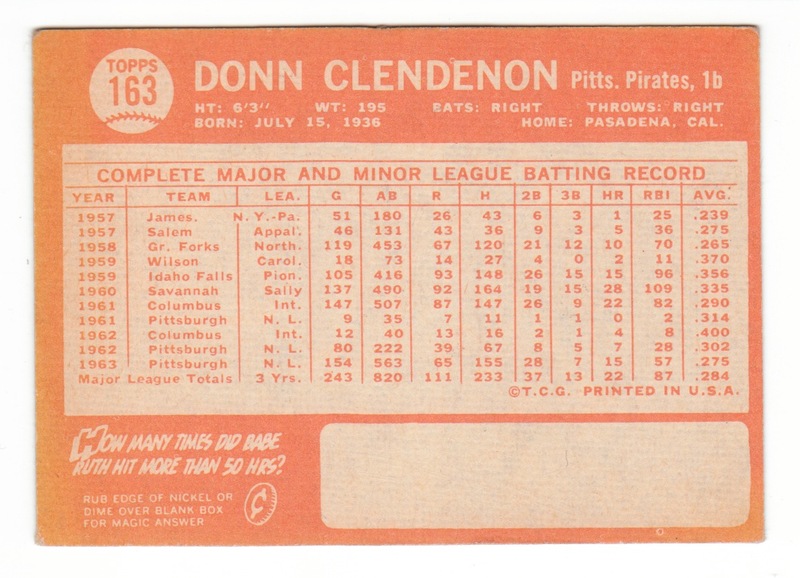 Donn Clendenon was really good at striking out back when striking out wasn’t cool. In fact, he did it 163 times in 1968 while only hitting 17 home runs. 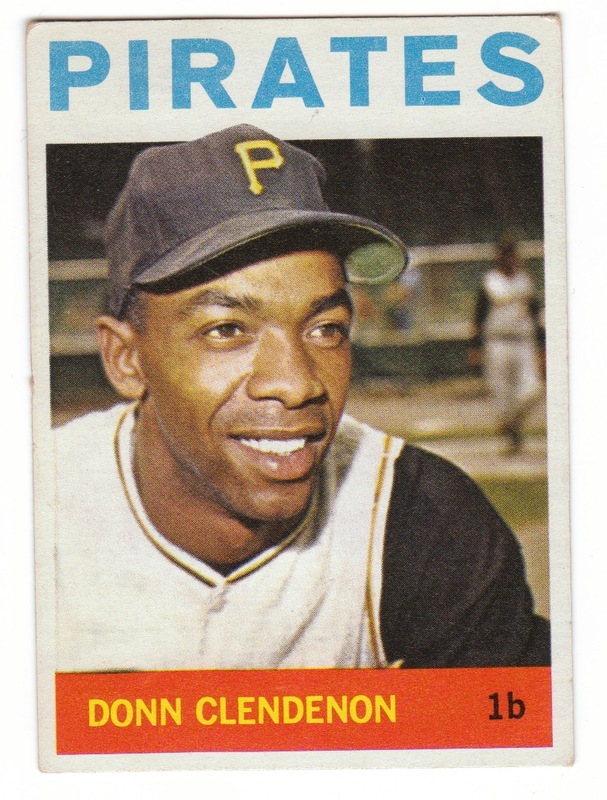 For the most part, Clendenon was a decent hitter who was never quite a star. In fact, he never played in the All-Star Game. But of the 10 seasons in which he had at least 250 plate appearances, he only once posted an OPS+ of below 100 (a 91 in 1967). He had a very nice 1965 season with the Pirates (.301/.351/.467 with 32 doubles, 14 triples, 14 homers, and 96 RBI), and followed it up with his best power season, slugging .520 with 28 homers in 1966. After a decline in 1967 and ’68, he was left unprotected in the expansion draft and the Expos selected him. However, they chose to trade him to Houston in January of ’69 as part of a deal for Rusty Staub, but Clendenon refused to report to the Astros because he didn’t like manager Harry Walker, who had been his manager in Pittsburgh for three years. The two teams eventually worked out a new trade, and Clendenon stuck with Montreal until June, when he was shipped to the Mets for four prospects (Steve Renko is the only one who went on to a significant career). Donn struggled early with the Mets, and split time with Ed Kranepool at first, but eventually he came on a bit. Still, manager Gil Hodges didn’t give Clendenon any playing time in the NLCS. Finally added to the lineup in the World Series, Clendenon hit three homers in four games and went on to be named MVP of the series, which we all know the Mets unexpectedly won in five games over the heavily-favored Orioles. His first two homers in the series gave the Mets a 1-0 lead in games they would win 2-1. His third came with the Mets trailing 3-0 in the sixth inning of Game 5, following the famed “shoe polish” incident. Cleon Jones took a pitch from Dave McNally down around his foot, and acted as if he had been hit and headed toward first. The umpire didn’t buy it and ordered him back, but Hodges emerged from the dugout and asked to see the ball, which was marked with shoe polish. The umpire reversed his call and allowed Jones to take first. Clendenon followed with a two-run shot over the left field wall at Shea. Clendenon followed with another nice year in 1970, hitting 22 homers and posting an .863 OPS. It was the only year in which he received MVP votes (he got 26, or 8%). But he declined in 1971, and Ed Kranepool took over the full-time job at first. Clendenon was relased by the Mets, and finished his career by playing in 61 games with the Cardinals in 1972. But he only hit .191 and never played again. Clendenon became a lawyer after his career. Ironically, while most players who have drug and alcohol issues have them during their playing days, Clendenon became a cocaine addict more than a decade after he retired from the game. When he sought treatment for his addiction, he learned that he had leukemia. After cleaning up, he became an addiction counselor in South Dakota before succumbing to cancer in 2005 at the age of 70. Donn was a very productive hitter on a Pittsburgh team loaded with hitters. The lineup included, Matty Alou, Roberto Clemente, Manny Mota, and Willie Stargell. He became expendable with the development of Al Oliver and Bob Robertson both of whom played first base when they first came up to the majors. One thing to remember about his home run numbers, he played at Forbes Field a huge park -457 to dead center. I was a young kid in the Polo Grounds when Clendenon clocked one to center against the Mets. I swear it hit some woman out there but again I was a young kid.